I help busy millennials feel better in their body + build a healthy relationship with food and fitness. 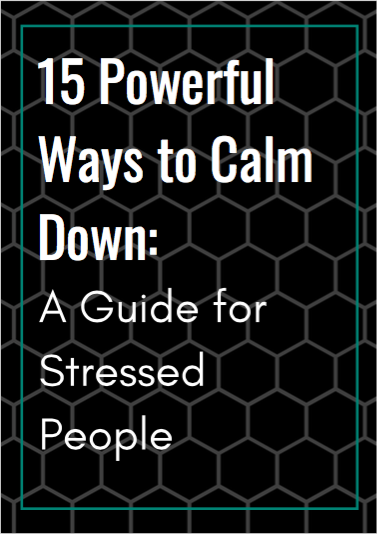 Click here to grab "15 Powerful Ways to Calm Down: A Guide for Stressed People"
You probably don’t see yourself as a 'gym person'. You probably don’t feel like you belong. Especially in the free weight section. I want to help you balance your priorities. I want to help you feel better. To have more energy, lower blood pressure, and less stress. I want to help you build strong, ache-free joints so you can go on that stunning hike without a second thought. I want to help you reach your goals in a way that lets you live the life you want without feeling restricted. What's the point of a sweet six pack if your super strict diet ruins your dating life? I ensure a comfortable, safe, and tolerant training environment, where exercise and movement is for fun and empowerment, not punishment. I'll never ask you to count calories or give up your favorite foods. You'll never stagnate. You'll start to actually crave and look forward to working out. Keeping healthy and fit as you get older will become easier and easier. Get strong and fit even if you’re not a gym person. Exercise can be something enjoyable, something you actually look forward to. Even if right now, the thought of going to the gym or exercising at home sounds more un-fun than Thanksgiving with your racist uncle. Build confidence and know exactly how to workout effectively and without injury. More importantly, you’ll enjoy the process in a welcoming, judgement-free environment. Create healthy and lasting food habits even if you’ve never been able to keep track calories. Never yoyo or stress about your diet again. Whether you want to lose weight for good or finally hear some good news about your health from the doctor, this is how you get there. Be the healthiest and leanest you’ve been in years, even if you feel like you’ve tried everything and nothing has worked so far. You’ll improve your health along with the way your body looks and feels (more sturdy and energetic, less achy and stiff). You’ll finally build exercise and nutrition habits that actually stick, so you lose fat without yoyoing. It may feel like you’re just not one of those “healthy/fit” people, but you’ll soon be the one your friends turn to for fitness advice. Having a stressful, exhausting, and hectic work life possesses its own set of challenges, but they’re not insurmountable. I’ve helped clients just like you tackle these same challenges. Who kept excelling at work, dropped body fat, got their first chin-up, and started wearing their favorite cocktail dress again. It’s possible with the right approach. This is my most comprehensive coaching program -- you get everything you need to ensure you get leaner, fitter, and more flexible no matter what life throws at you.